En række europæiske menneske- og borgerretsgrupper vil forsøge at gøre 20. september til en stor, fælles aktionsdag med demonstrationer og andre aktioner i hele Europa, helst så de kan give genlyd i medierne i samtlige EU-lande. Aktionsdagen organiseres bl.a. af den tyske forening AK Vorrat, hvis retssag mod det såkaldte "Stasi 2.0" vi tidligere har omtalt. The plan is to call to demonstrations, street parties, art actions, sit-ins, happenings, blockades in every european capital at the same day, at the same time. We would like to ask all known NGOs dealing with free speech, civil and human rights, digital rights etc. from all over europe to join forces and participate at this european-wide action day in september 2008. This action day means, that you are asked to get in contact with as many organisations as possible and plan "classical" demonstrations, arts actions, flashmobs, even street parties, public lectures, sit-ins or other activities in the public space in every european capital at the same day. 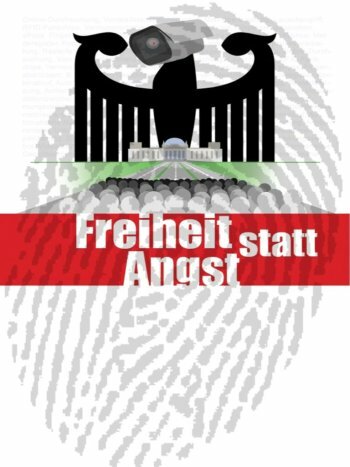 The motto is "Freedom Not Fear 2008", but may be extended with additional titles/subtitles to fit into your Corporate Identity or target on your national agenda. The day this campaign takes place is planned to be September, 20th 2008 - we thought, in most european countries the parliament's holidayy have ended then and we will therefore be able to retain a lot of media attention. The wiki is multilingual, please register an account. I/we will fill the wiki-page with more information step by step. A dedicated "HowTo", which will help you organize something, will be translated soon. For any questions and comments, please feel free to get in contact with me. A multilingual coordination office will be set up in Berlin within the next 1-3 months. Aktionsdagen har fokus på borgerrettigheder og deres vilkår i en tid med terrorlovgivning, eskalerende overvågning, censur af Internettet og "terror"-relaterede bortførelser af europæiske borgere til lande, hvor de bruger tortur - for blot at nævne nogle få punkter. Til de af mine læsere, der er medlemmer af en politisk bevægelse, vil jeg opfordre til, at man kontakter sin organisation og forsøger at finde ud af, hvordan den kan deltage i denne aktionsdag. Det kan være både stort og småt. Demonstrationer, happenings, flash mobs - alle initiativer er velkomne. Vi kan kun miste vore rettigheder én gang - og det ser desværre ud til, at det er nu, vi er nødt til at kæmpe for dem, hvis vi gerne vil beholde dem.